If you have ever been camping, then you know the importance of maintaining tools and keeping them in their best shape, ready for use. If you have been hunting, the same applies with guns and especially knives. With ninja blenders, you need not ship the ensemble or select components to the manufacturer when you can do the deed yourself. As DIY tasks go, blade sharpening will require some practice but it is not impossible for the average user to perform. Dull blades are never the case with new ninja benders, perhaps one that you have had and used for a few years. On such devices, the blender blades could do with a re-sharpening. With the right tools and technique, you can do this at home. 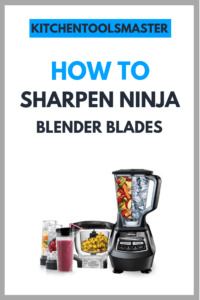 To sharpen your Ninja’s blades and get it back up to its pureeing, chopping, dicing, and blending prowess, you will first need to unplug the Ninja. The last thing you need is an electric shock for some reason that has nothing to do with you or the blender. The blender jug has to be set aside. Separate it from the base, namely the big sitting portion ensconced in plastic and housing the motor. At this time, you can if you like choose to wash the plastic container in case you have plans to blend a smoothie immediately after blade sharpening. You can give it a second clean once the sharpening process is done. Clean the rest of the device at this time too; mild dishwasher and a brush or cloth will do. The time has come for you to remove the blade. The jug bottom contains the base that holds the blades to the jug. Twist counter-clockwise. The base will come freely away in your hands. Place the jug in a safe soft, especially if it is one of those Ninja models that come with glass blender jars. The base in your hand comprises a seal with the blades attached firmly to it. Remove the parts as needed and place them near the jug for safekeeping. The blades alone should remain. Give those blades another rinse in the warm soapy water. Any particles on the blade? Any food bits gone hard? Clean using a brush. You will now need to call upon your outdoor skills. A sharpening stone is in order. A simple YouTube video can help you get the hang of things, in case you have no idea how to perform this part. Wear protective gloves in case the blades slip from your fingers. Slide one of the blade edges along the sharpening stone as you were taught to do. You never slide the stone over the blade, remember that. It is always the blade against the stone, so the momentum with which you quickly move the blade across that rough stone surface will create friction and heat to sharpen the edge. If you slide the stone itself, the effect will not be as powerful; it’s a Physics thing. The safest and most recommended technique is to slide the blade away from your body, never back inward. Not only is this a cautious move it is also compulsory if you want to get that friction and heat we mentioned earlier. Each blender blade (there are generally four) will have two backs and two fronts (the upper curved portions and the lower curved portions). You need to turn the blades over as and when you need to and sharpen them each efficiently. Once you have carried out this step according to what you have learned or seen online, you need to check if the blades are as sharp as you need them to be. Simply cut a veggie or fruit slice and, if you are satisfied with the smoothness, it will be time to reassemble the blades. Have the blades sit on the jug base. Attach the seal or wax ring as you saw it before disassembly. Fix the twain with a clockwise twist; check for integrity. Attach the jug to the blender base, namely the countertop piece. Plug it in, attach the lid just in case, and give those blades a whirl to see if they are doing alright. What if you do not want to go through the rugged experience of sharpening the blades on your own? Contact the manufacturer’s customer support and see if you can mail the blades over. They will most probably make special allowances so customs will not assume you are trading in weapons J. The manufacturer, if a rich and powerful company, will even waive shipping costs from you and pay it on your behalf; because they love their Ninja and you do too. But bet on the reality of paying for your own mail and seeing that you get confirmation that the blades have reached the right destination. 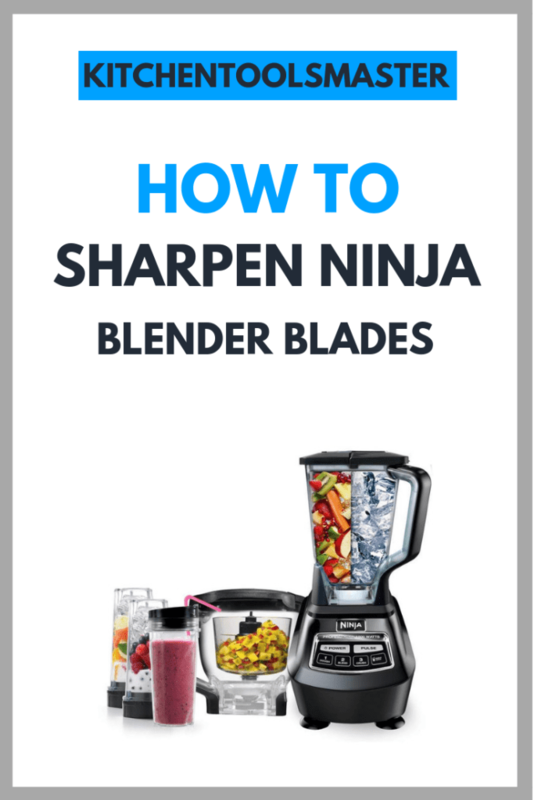 Sharpening Ninja Blender blades is no big deal. The real problem rests in injuring yourself. While the blades are in need of some sharpening, they will still be keen enough to cause mischief if handled inappropriately. So, word of caution, take care while handling the blender blades and if you do hurt yourself, please do not be that person who calls up the manufacture and threatens to sue. Your blender blades are a work of art in their own right, and with regular sharpening you can squeeze out every last drop of nutrition from the foods you add to the blender jar. That is all there is to sharpening your blender blades. It will take up all of one hour, maybe a little more, and you will be good to use this super-powerful blender to make yummy health juices and organic smoothies for yourself; friends and family too, of course.